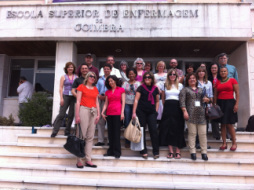 The Third Annual Working Meeting of the International Collaboration for Participatory Health Research (ICPHR) was held at the Nursing School of Coimbra (Portugal) on May 10 – 12, 2012. The Catholic University of Applied Sciences (Berlin, Germany), the Wellesley Institute (Toronto, Canada), and The University of Alberta (Edmonton, Canada) hosted the meeting in partnership with the Nursing School of Coimbra. The 26 participants attending the meeting were from diverse disciplines and constituencies reflecting a cross section of stakeholders from 9 countries (Canada, Germany, United Kingdom, Portugal, Mexico, Brazil, France, and Cape Verde). International Patterns: Research project to describe systematically what PHR means in different countries and cultural contexts. New International PHR journal: Developing a concept and plan for launching an interactive and innovate journal. Workshops in and for the community: Developing a workshop for community partners in Germany, Portugal, and Brazil. The next Annual Working Meeting in 2013 will be held in at the University of Northumbria in Newcastle, UK. The 2014 Annual Working Meeting is planned for Brazil.